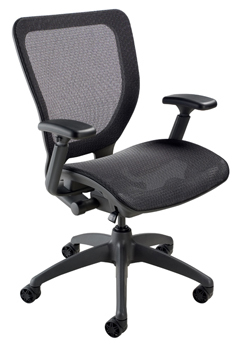 The WXO Midback chair translucent ABLEX™ patterned weave mesh back and seat provides generous lumbar and thoracic support while promoting dynamic back movement. The WXO Midback chair comes in the 2 styles shown above - with Mesh seating and as a Task chair. Overall dimensions of the Midback chair with Mesh seating: 20" wide, 19 1/2" deep, 36 1/2" - 40" high, seat height 16" - 20 1/2 ". 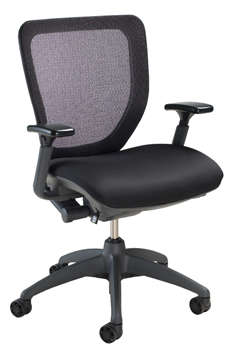 Overall dimensions of the Mid Back Task chair: 20" wide, 19 1/2" deep, 36 1/2 " - 40" high, seat height 16" - 20 1/2". This product features a 5 prong heavy duty nylon base with 2" mag wheel carpet casters.